We have a special team in Russia this season with just one guide and one very strong client. Gaspar Navarrete is leading the charge with Jim Walker right behind him. 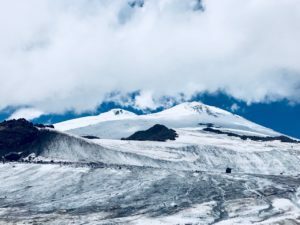 The target is Elbrus, and the guys are making great progress already. For his final training push, the week before leaving for Russia Jim climbed a 14’er in Colorado to get prepped for the fast expedition. This is a fantastic way to get the body ready for higher altitudes and something we always recommend to our climbers. If you can fit it in, altitude training in Colorado is one of the best ways to get pre-acclimatized. 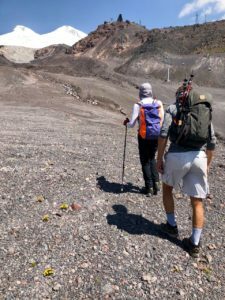 If you don’t have the ability to get to Colorado, there’s always our Rapid Ascent expeditions where we pre-acclimatize from the comfort of home. Gaspar just got done with a long expedition in Peru so he is fit and ready to lead Jim to the top of Elbrus in good style. With their good training before hand, the guys joined up and flew straight into the Baksan valley at 7,545′ / 2300m. No rest for both of these strong guys as they ate a quick lunch on arrival to pack in some calories and then they were off for a hike to the top of some ski lifts in the valley to further their acclimatization. They topped out at 12,795′ / 3900m that day and both were feeling good at the high elevation. 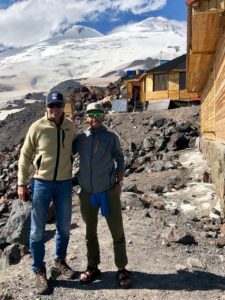 The very next day the guys continued their acclimatization plan and hiked from 9,842′ / 3000m to 13,451′ / 4100m. Gaspar reported that it was a good push and Jim was feeling great. The weather report they received forecast some bad weather moving in, so they made plans to summit on the next good day of weather which will be Sunday, August 5th. Until then they will be moving up to the famous “Barrel” huts on Elbrus and will probably hunker down until the weather clears. The barrels provide great food and really comfortable lodging so they will be living up there in good style. Today Jim is hiking with our local Russian guide to give Gaspar some time to work out exact logistics. The guys took the cable car to 12,795′ / 3900m and pushed all the way to 16,076′ / 4900m on foot. The report from Gaspar says that Jim is in very good shape and is acclimatizing well. Well done Jim! Good luck Jim and the whole team!